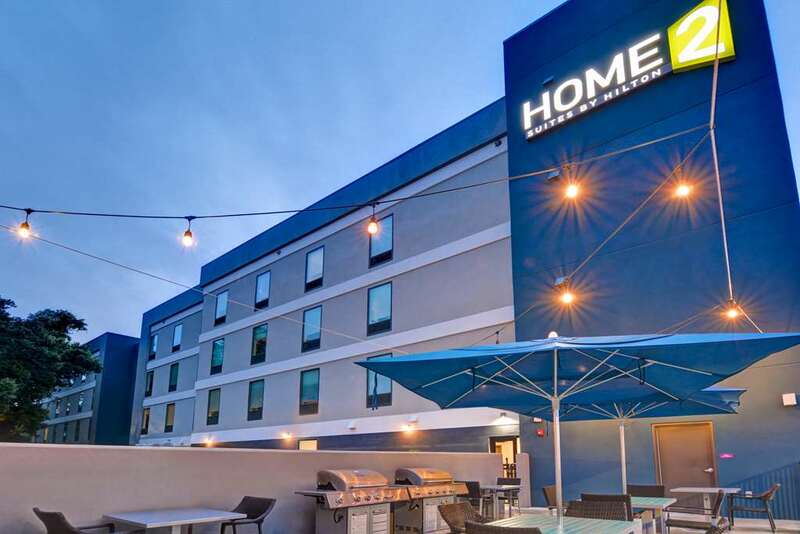 The new Home2 Suites by Hilton Pensacola I-10 at North Davis Hwy will make you feel at home while you*re traveling for business or on vacation. Conveniently located just off Interstate 10 this all-suites hotel is only five miles from Pensacola International Airport. Local attractions including the University of West Florida West Florida Hospital Naval Air Station Pensacola and the beach are less than 17 miles away. Prepare meals in the microwave in your studio suite relax on the sofa bed while watching a favorite show and multi-task in our Spin2 Cycle Center doing laundry while exercising. WiFi is free. When you want a change enjoy an artisan sandwich for your free hot breakfast. You*ll also have access to our business center year-round outdoor pool and cozy fire pit. We offer accessible suites with roll-in showers or visual and audible alarms. Upgrade to a one-bedroom suite for more space and privacy. Popular leisure attractions in addition to Pensacola Beach are Sam*s Fun City Fort Barrancas and the National Museum of Naval Aviation. The caring staff at Home2 Suites Pensacola I-10 at North Davis Hwy will welcome you and your pet when you visit our Florida city. SHARK FIN: Beautiful Japanese - Chinese fusion restaurant with a full Bar and a high end Sushi Bar. Tijuana Flat: Kitschy Mexican chain restaurant known for an extensive hot sauce bar - colorful muraled walls. The Egg - I: Breakfast restaurants serving family style breakfast and lunch food. The Egg - I offers the best local breakfast restaurant. Texas Roadhouse: Lively chain steakhouse serving American fare with a Southwestern spin amid Texas-themed decor. Bonefish Grill: Contemporary grill chain offering a seafood-centric menu plus steaks - cocktails.